On Tuesday, January 11, 1938 at 12:45 P.M., from Room 403 in Belle Skinner Hall, Vassar College's very first radio broadcast hit the airwaves via station WGNY Newburgh. The Vassar College Committee on Broadcasting, composed of faculty and students, had arranged with Peter Goelet, owner of WGNY, to allow the college to broadcast from 12:45 to 1:00 P.M. on Tuesdays and Thursdays. The content of these early broadcasts ranged from musical performances (hence the location of the studio in Skinner Hall of Music) to short talks by both faculty and students on their areas of expertise. The mission of these broadcasts was "to share the educational facilities of the college with the surrounding counties and to strengthen the relations of the college with the outside communities through the medium of radio." This small foray into the world of wireless grew, and by 1941, the renamed student-faculty "Radio Workshop Committee" broadcast two regular programs: one on station WKIP Poughkeepsie entitled Vassar Professors Talk it Over and the other from WGNY entitled Vassar on the Air. The former program included announcements of college events and interviews of Vassar professors about the topics of the day. The latter program sported an eclectic array of programming designed to appeal to the greater Dutchess community. For example, with national defense a topic dear to America's heart in the early forties, the station provided programming based around this theme. Early radio production at Vassar was difficult; a not-so-soundproof station and lack of advanced equipment made Vassar radio pioneers work hard to create a professional-sounding product. To ease their hardship, a new studio and control room in Skinner were built in 1951 with a high-fidelity sound system and recording equipment. Early radio broadcasting at Vassar was aimed primarily at the outside community, using local radio stations and tailoring programming specifically to broader community interests. The Radio Workshop Committee began discussing an on-campus radio station as early as 1954, a station that would "carry music, campus news, current activities, discussions, drives, elections, etc" especially for Vassar students. The realization of this dream would take many years, but in the early seventies WVKR Vassar College Radio was born. Broadcasting from Main Building, the station was built with college funds and with a yearly operating budget drawn from the Vassar Student Association (then known as the Student Government Association). 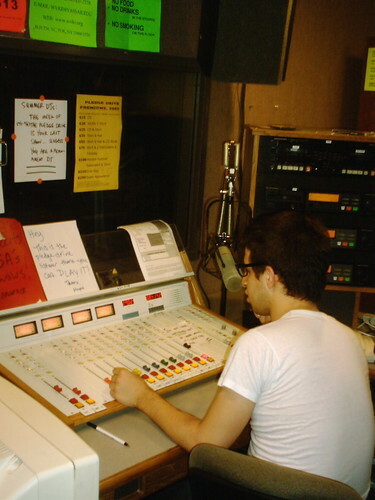 The first incarnation of WVKR was an AM Carrier Current station, which broadcast twenty-one hours a day to every dorm, townhouse and terrace apartment via a campus-only closed-circuit. (1) Its mission was to provide alternative, but educational programming to the community and to teach radio enthusiasts the principles of broadcasting. Enthusiasm for the station soon grew such that its voice could not be limited just to campus. On October 6, 1976, the station was granted an FCC license to change to FM and broadcast off-campus on a frequency of 91.3 kilohertz. The 10-watt transmitter in Main sent the station's signal out in an 18-mile radius around campus. The station broadcast twenty hours a day, from 7 A.M. to 3 A. M. Support from the Poughkeepsie community was strong; the station held a fundraising drive in February 1978, during which 70 percent of the approximately $4,000 it raised came from the broader community. "I consider myself very fortunate," said Gabor Pattantyus of Poughkeepsie in a December 3, 1977, letter to the editor of the Poughkeepsie Journal, "that I live within the listening area of WVKR-FM… where classical music is being played during the weekend… I would like to extend my best wishes to WVKR-FM." As of 2004, the station broadcasts from a rented transmitter across the Hudson River from Vassar with 15,000 watts of power. Its current studio is on the third floor of the College Center, from which it broadcasts twenty-four hours a day, seven days a week. Its programming has evolved over the years to include shows from members of the wider community and to embrace the changing American musical scene. The mission of the station, however, has remained the same: to promote music not heard elsewhere and to serve the community interest through eclectic radio programming. There is discrepancy in the record over the exact year. Several college press releases from the 70s refer to 1970 as the date of first broadcast, and this date recurs in official announcements. However, a letter from the 1975 WVKR General Manager to the community puts the date at 1972. A press release from 1994 suggests that the date was 1971.